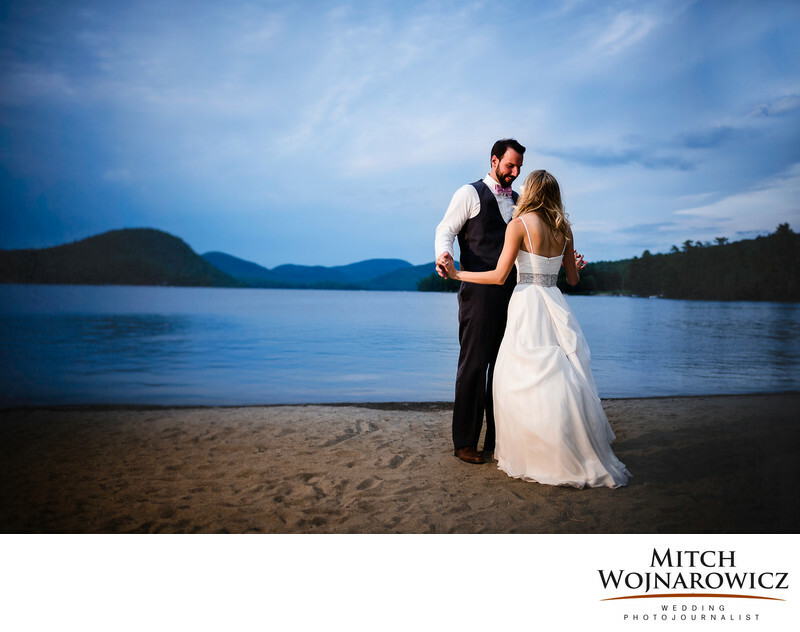 Point O Pines wedding photographers..As a veteran of many Point o Pines weddings in the Adirondack Mountains of Brant Lake New York, I have seen the beautiful mountain scenery surrounding the venue in Spring, Summer, and fall. Brant Lake is a stunning location for your Adirondack wedding whether you are planning a rustic Adirondack wedding or something that harkens back to the traditions of the great camps and are planning a very formal Adirondack wedding...Alyssa and Dave's wedding at Point o Pines took a familiar course with an outdoor ceremony near the towering pine trees followed by a cocktail reception out on the deck overlooking the beach and the lake. I work hard for my clients, starting the planning process very early once we have booked the wedding date. The work I do with my clients on the schedule is done with the goal of making sure that the bride and groom spend as much time at their wedding reception as possible. There will never be a two hour long portrait session taking the bride and groom away from their guests and their party. This photograph is a great example of what I love doing on the wedding day, which is stealing five minutes here, and 15 minutes there with the couple so that we may make some relaxed portraits that truly reflect the feelings the couple have for each other and our photographs that let their personalities and their emotions shine. During the reception, once the early formalities were over with and the couple had some dinner, we went outside to the beach at their Brant lake wedding and spent about 15 minutes allowing them to relax a little from the attention from all of their guests, stepping away from the swirl of the day for a few minutes to relax. A wonderful set of intimate and natural wedding portraits was the result of a few minutes of time we spent together on their Adirondack Beach..
Keywords: adirondack (60), point o pines (3).